i. Passed HSLC or equivalent Exam from Govt. recognized Board/ Institution. ii. Passed All India Trade Test Certificate Course in Book Binding Trade from ITI with 2 years Apprenticeship Trading in any Govt. recognized Press or Assam Govt. Press. ii. Passed All India Trade Test Certificate Course in Letter Press Machine from ITI with Apprenticeship Training in any Govt. recognized Press or Assam Govt. Press. Age: 18 to 43 years of age as on 01.01.2017. The upper age limit is relaxable by 5 (five) years in case of SC/ST candidates. a) All certificates (Xerox) in support of Educational Qualification along with Age, Case and other testimonials including valid Employment Registration Card declared by himself/herself as “certified that it is the true copy of the original”. b) 2 (two) copies of recent passport size photograph duly self attested. c) A self addressed envelope size (22cm x 10 cm) affixing postal stamp of Rs.5.00 only. d) Applicants will have to superscribe “Post applied for” at the top to the sealed envelope carrying the application. 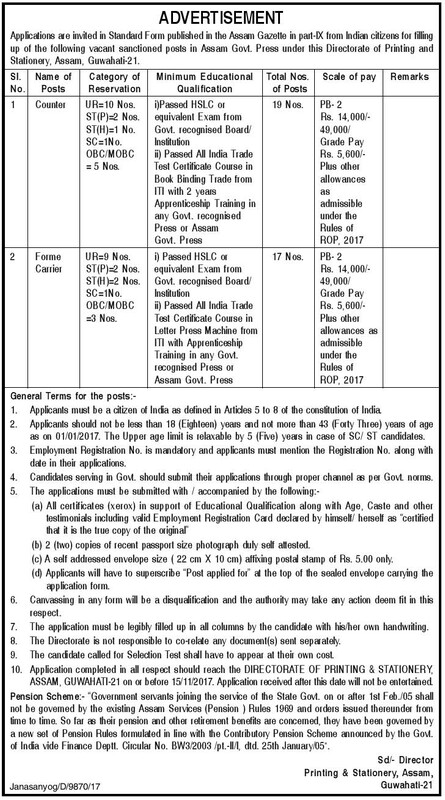 Application completed in all respect should reach the DIRECTORATE OF PRINTING & STATIONERY, ASSAM, GUWAHATI-21 on or before 15/11/2017.